This week I had the privileged of attending Cash for Kids Superhero Day launch. 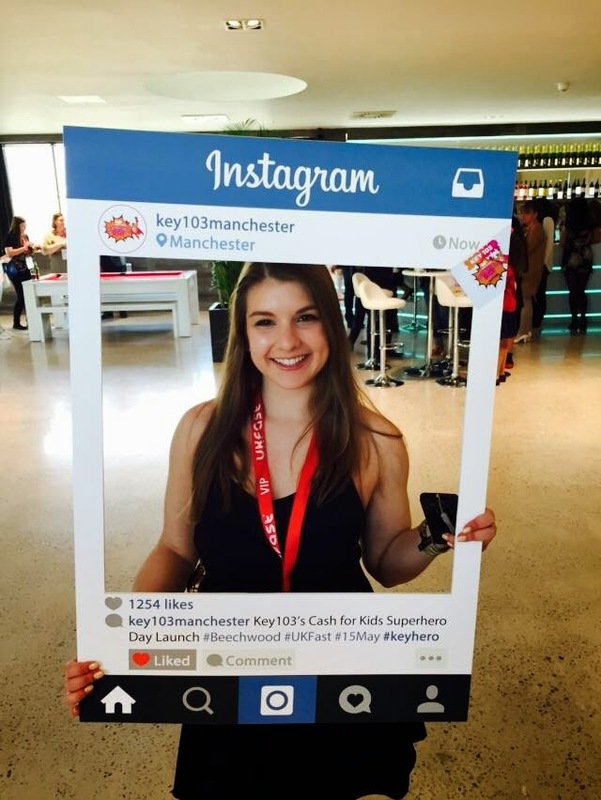 Cash for Kids is Key 103's official charity which does amazing projects to help raise thousands for disabled and disadvantaged children around Greater Manchester. All the money is raised locally and spent locally, and goes to children and young people under 18 throughout the region, with mental, physical or sensory disabilities, with behavioral or psychological disorders, living in poverty or situations of deprivation, suffering through distress, abuse or neglect. This year, they are supporting Beechwood, a cancer care center based in Stockport which helps and supports patients, carers and family members of those who are affected by cancer and other life limiting illness. They offer patient programs, one-to-one counselling, complementary therapies and support groups, and have become one of the largest independent charities in the area. What's more. they do this absolutely free of charge for everyone. ​With funds raised through Superhero Day, Beechwood will be helping children who are going through the hardship of losing a parent to cancer or other terminal illnesses. 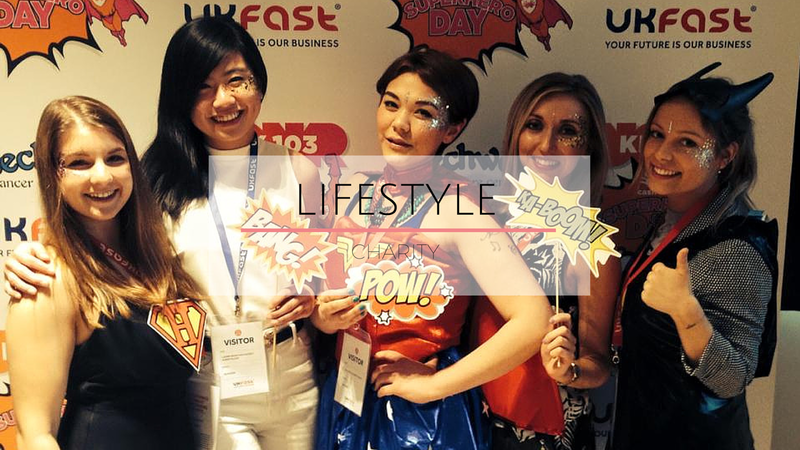 To launch this year's Superhero Day in aid of Beechwood, Key 103 in partnership with UKFast put on a lovely event at the UKFast office in Manchester. The event itself was amazing. 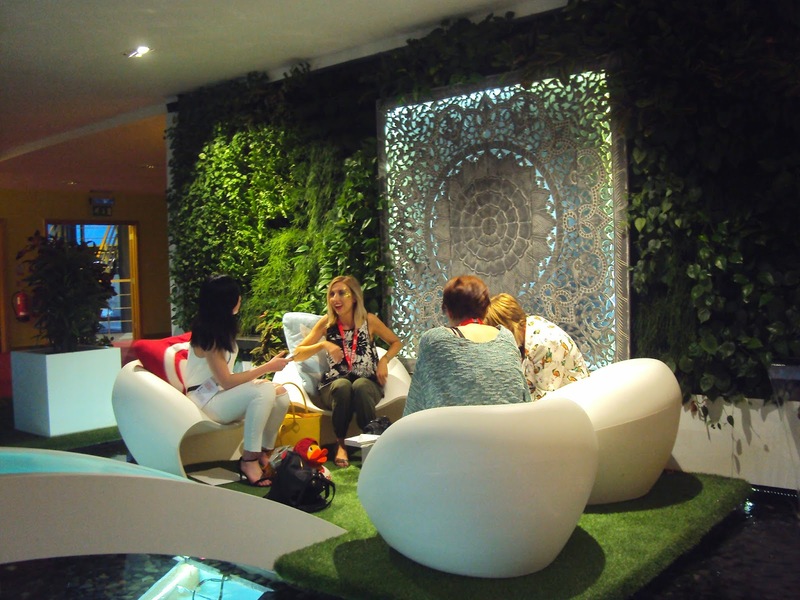 Besides being held in the coolest office space I have ever seen (yep, that's their office in the picture above), some of Ledigo PR's clients were there to make the night even more extraordinary. Cupcakes by Zara Cakes were provided (and devoured) and Wish Upon a Sparkle were offering glitter makeup. There was also a 'Superhero booth' with tons of costumes and props to help us channel our inner superhero. After a brief reception where we got to brush shoulders with the likes of former Manchester United star Phil Neville, we were taken into the auditorium for a presentation on this year's charity project. Key 103 DJs Mike Toolan, Chelsea Norris, and Darren Proctor gave lovely presentations, along with representatives from Beechwood. 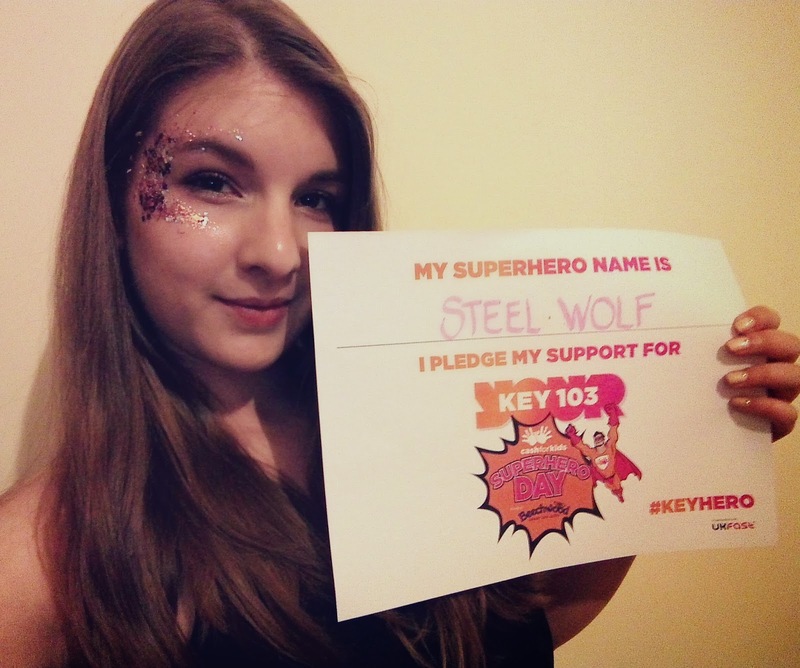 By the end of the night, I became an official Superhero, or KeyHero, by pledging my support for Cash for Kids Superhero Day and Beechwood. My goal is to raise £100 by Friday May 15th and I need your help! Please head over to my fundraising page or Cash for Kid's donations page and show your support for this amazing charity. Alternatively, you can call 0161 288 5155/5007 or text KEY to 70070 for an automated £5 donation - don't forget to tell them 100 Things I Love Blog sent you over! £5 pays for a box of bubbles that they use to allow children to release frustration. £10 buys a bag full of worries book that they give to children, helping them understand that they aren't alone. £15 pays for a plain memory box that would then be decorated - a special place to keep those precisous items to keep the memories alive. £20 pays for a 3D memory letter - a visual reminder that can go next to a child's bed. £30 pays for a memory pillow made out of favourite items of clothing to be created - helping children keep something to hug when things get to much. £50 pays for an hour's counselling at the Butterfly Centre, helping children come to terms with what is happening to their family. £75 pays for an hour's counselling in a school or hospital setting enabling children to stay with their parents whilst they are in the hospital or hospice making the most of those last days. £100 pays for transport for a chil to get to Beechwood for sessions if their parents didn't drive, making sure thay are accessible to everyone when they need. £1,000 enables Beechwood to hold a family memory evening, giving children the opportunity to get together with others to celebrate the life of a lost parent. It is important that children get the opportunity to enjoy a little normality, music, games, and pizza. The evening culmintes with the release of balloons, each with a personal message to mum or dad in heaven. £2,000 enables them to hold a Christmas party for the families at the most difficult time of the year. When everyone else is full of excitement and wonder, many of their families dread this time. Beechwood would be able to hire a hall and provide catering and gifts to make this time just that little bit better for children. £3000 helps Beechwood see a child from the moment their mum or dad gets the news they are terminally ill and support them through the illness, dealing with them watching the visual changes and coming to terms with the fact that things wil never be the same again, helping them say goodbye and then helping pick up pieces following the funeral. £5,000 enables them to achieve their aim of making memory quilts from clothing or bedding from a lost parent or close family memeber. Beechwood would be able to purchase 2 sewing machines and all associated equipment. 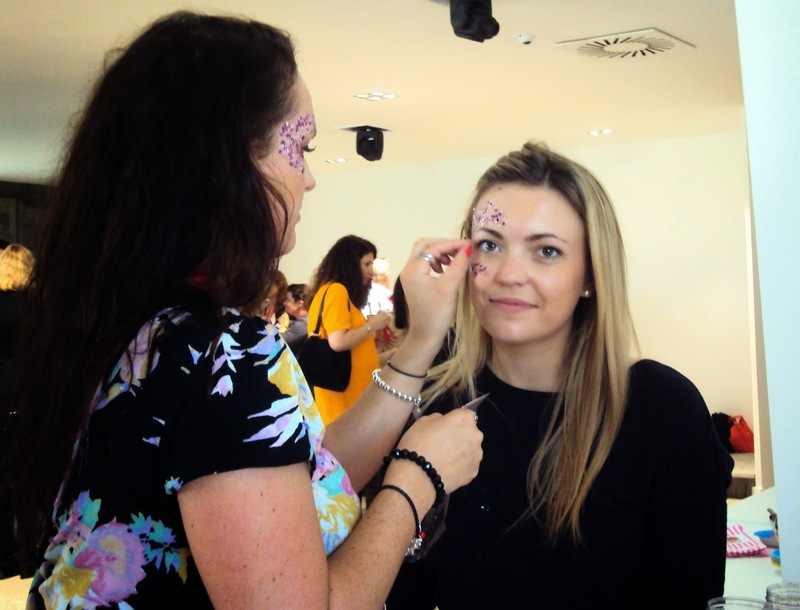 They would be able to hold regular creative therapy workshops giving each child a lasting memory that they can wrap around themselves in times of sadness. £10,000 would allow Beechwood to do all the projects above and make a huge difference to the lives of children and families devastated by cancer, illness, suicide and accidental death. If you need more information about the charity, donations, or how to get involved yourself, feel free to leave a comment below or email me at 100thingsilove.blog@gmail.com. If you are ready to make a donation, please visit my fundraising page or Cash for Kids' donations page. I want to encourage everyone to share their donation confirmation below so I can keep track of how much has been raised.